At the Gateway Farm Toy Show I always keep my eyes open for those items that are new and different to write about in Toy Farmer and Farm World. 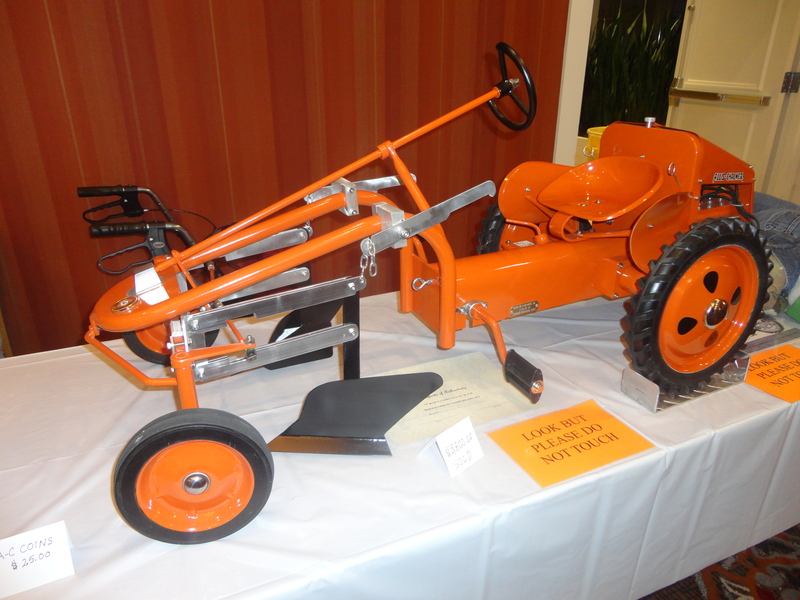 This year I was excited to see Don Turner’s very cool Allis Chalmers G pedal that he scratch builds. Don is building only 25 of these and each one is a bit different. The last ones, from 21 on even have their own attachments. Don’s wife Diane said that all of the pedals have now been sold even though Don is just now working on pedal number 23. It didn’t take long for Don who has his own business Turner Welding and Farm Equipment that refurbishes old tractors and makes parts for antique tractors completed his toy. The friend that had thrown out the challenge wanted to pedal, but Diane called dibs on the first one made. The couple are also going to keep number 25 which will have six attachments! Besides the pedal model, the Turners also have the 6th AC G built which was the first that was commercially sold. “The G was only built in Gadsden, Alabama near where we live,” Diane said. The Turners are very busy working on their pedals and selling parts, we were lucky to be able to see this piece of art at the 2014 Mid-America Farm Toy Show in St. Louis, Illinois!